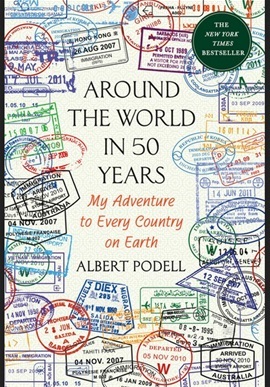 Rolf Palmberg: Review of Albert Podell: Around the World in 50 Years. My Adventure to Every Country on Earth. New York 2016: Thomas Dunne Books. This is definitely not a traditional travel book that presents events in a day-by-day or even year-by-year order. Sometimes it does, it’s true, but very often the chapters of the book focus on specific themes and introduce different areas of the world generally rather than chronologically. There are of course advantages with this approach, but in order to identify correctly the timeline of Podell’s journeys (which I tried to follow) I often had to refer to his list of “Countries visited in chronological order” included at the end of the book. A disadvantage with this approach is that some countries are not mentioned at all in the book (apart from the list mentioned and despite the subtitle of the book). I particularly enjoyed the chapters where Podell describes practical issues such as how to get visas and other necessary documents for “difficult” countries, how to plan journeys and at the same time taking into consideration the different characteristics of each journey (transport modes, equipment needed, money matters, security issues, etc. ), how to deal with the unfortunate but unavoidable bureaucracy involved, and, what to do and what not to do in different parts of the world. However, in my opinion sometimes Podell brags too much about himself and makes unnecessary fun of other people and their religion and cultural traditions. Being a “country-collector” myself, I also appreciated Podell’s attempts at defining the relevant concepts of ‘country’ and ‘visit’. His criteria come very close to mine, but there are of course not any ‘right’ or ‘wrong’ ways of looking at this issue. For example, it is not clear to me why Podell does not count “Countries that no longer exist”. I have visited former Czechoslovakia, East Germany, the Soviet Union, and Yugoslavia, and they are still on my list of “Counties visited”. Why wouldn’t they be?